Fast, easy and cheap flowering static grass tufts, key word here is cheap. If you plan on making a lot of grass tufts for a neighborhood scene or a vast country landscape with plenty of flowering bushes then making them yourself is probably the best way to do it. If you don’t have a static grass applicator you can follow along in two of my videos where I show how to build one again on a budget. It’s much cheaper than buying a commercial one and the results are equally as good, but that being said, the commercial ones are great and if you’re not keen on a DIY version then they work just the same. 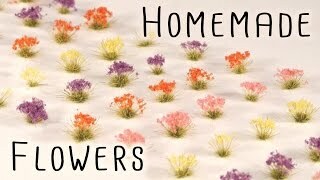 Hope you enjoy the video and have fun making hundreds of these fantastic flowering bushes for your model railroad layout. They are great for HO scale but will also work for other scales like N, O and of course OO.